Mapo Oil Depot, an oil storage facility set up in the 1970s, has been given a new lease of life, with its massive tanks transformed into venues for exhibitions, concerts and cultural events. 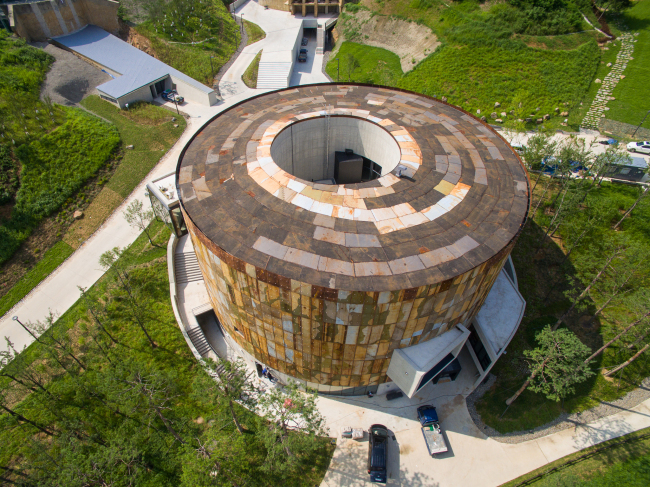 Located at the foot of Maebongsan in Mapo-gu, west of Seoul, the former oil storage facility -- now called Mapo Cultural Depot Park -- consists of six large tanks. The Korean government constructed five large oil storage tanks for national energy security amid an oil crisis in the 1970s. The place was abandoned after its operation was halted in 2000. The sixth tank was built last year as part of the depot’s renewal. Making use of this site was one of the first projects Mayor Park Won-soon initiated after he took office. Park’s main question was how to maximize the potential of the old 11,510-square-meter space. “Through six rounds of public hearings and contests in which citizens, students and city construction experts participated, a public consensus was constructed that the site should be renewed into an eco-friendly culture complex,” said Choi Hyoun-sil, director of the parks development division under the city government. A detailed blue print was unveiled earlier this year, which focused on transforming the site into a place for cultural events, performing arts and exhibitions. “By taking into account the fact that the area around the storage was the city’s garbage dump and that it is close to major performance venues such as the Sangam World Cup Stadium and the Digital Media Center, the city government decided that it would be appropriate to build a culture park on the site,” said Heo Seo-goo, architect and CEO of Wondoshi Architects Group, which designed the culture park. “Although the surrounding area had seen a rapid pace of makeovers for the past 10 years or so, the oil storage site had remained a remnant of the industrial age,” Heo said. Instead of demolishing the former oil storage facility, the city government decided to keep the 15-meter tank walls and retain the natural topography of the area as much as possible. The facility was 10 times larger than Seoul Plaza. Heo highlighted how the storage tanks have been revamped. “These tanks were empty and still are empty, although they have been transformed into exhibition halls and concert halls. The unique beauty of these massive oil tanks will provide joy and fun to citizens,” he said. Following its grand opening in September, over a thousand people have visited Mapo Cultural Depot Park, which has walking trails and eateries. Out of the original five tanks, tank one has become a multipurpose pavilion made of glass. A design festival was recently held there. Tank two serves as an outdoor amphitheater with a wall of cascading green vines and concrete stones scattered around that can be used as seats or tables. Tanks three, four and five are spaces for exhibitions and cultural events. Tank six -- the largest -- serves as an information center. It also houses a cafe on the bottom floor. 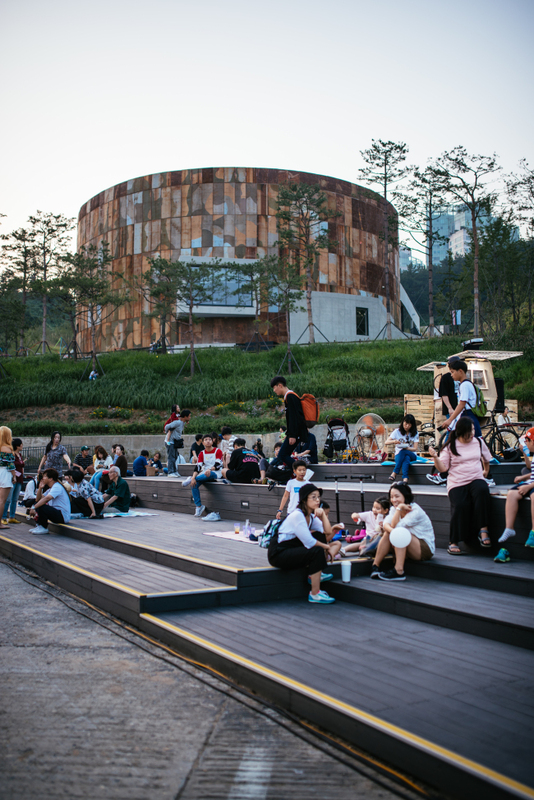 Mapo Cultural Depot Park represents a new model for public development through renewal, Seoul City said. “Without wide public discussion such as contests, civic forums and expert workshops, it would have been impossible to come up with the best idea -- to have the old oil reserve reborn into a place for every citizen,” said Lee Je-won, director of urban planning at Seoul City.